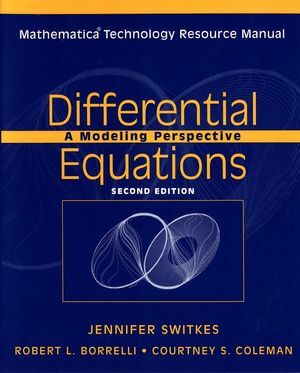 The Mathematica Technology Resource Manual, authored by Jennifer Switkes of California Polytechnic State University, Pomona, consists of tutorials that deal directly with the Mathematica computing situations that students may encounter as they work on homework problems from the text. Robert L. Borrelli is the author of Mathematica Technology Resource Manual to accompany Differential Equations, 2e, published by Wiley. Courtney S. Coleman is the author of Mathematica Technology Resource Manual to accompany Differential Equations, 2e, published by Wiley. 5. Numerical Solutions of ODEs. 9. Euler's Method, Heun's Method, 4th-Order Runge-Kutta. 10. Laplace Transforms: Discontinuous Driving Terms. 11. Orbits, Solution Curves, Component Curves. 15. Laplace Transforms: Dirac-Delta Driving Terms. 16. Orbits and Component Graphs. 19. System of Three or More ODEs. 22. System of ODEs in Polar Form. 23. Plotting Partial Sums: Fourier Series. 25. Recursion Relations: Series Solutions. Common Functions and Constants in Mathematica.